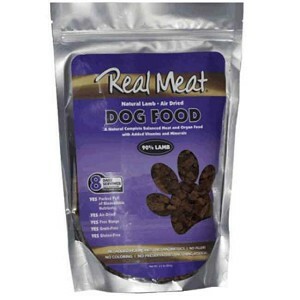 Real Meat Lamb Dog Food Air Dried 2 Lb. A Natural Complete Balanced Meat and Organ Food with Added Vitamins and Minerals. Easy Substitute for Raw Food or a Tasty Topper Smells Great Tastes Better! - Packed Full of Bioavailable Nutrients - Air-Dried - Free Range - Grain-Free - Gluten-Free NO Artificial Colors NO Fillers NO Artificial Preservatives For all breeds of dogs and cats. The gentle air-drying process delivers a high quality, high meat content food while maintaining the nutritional integrity of the natural raw materials. Each serving contains over 90% of nutritional, air-dried free-range meat and organs, in a highly digestible form for optimum health. Storage Shelf stable. No need for refrigeration. Keep fresh, clean water available at all times. - When transitioning from grain-based dry foods to Real Meat High Meat Diets, introduce slowly over 5 days. Lamb, Lamb Liver, Lamb Heart, Lamb Kidney, Pumpkin, Inulin (from Chicory), Vegetable Glycerin, Ground Lamb Bone, Yucca Schidigera(BioAide), Pea Powder, Kelp, Parsley, Rosemary, Sea Salt, Betaine, Choline Chloride, Mixed Tocopherols (Vitamin E Supplement), Pomegranate, Zinc Proteinate, Zinc Sulfate, Iron Sulfate, Vitamin E, Flaxseed, Barley Grass, Yeast Extract(Agrimos), Iron Proteinate, Selenium Yeast, Copper Sulfate, Nicotinic Acid, Calcium Pantothenate, Copper Proteinate, Manganese Proteinate, Vitamin A Supplement, Vitamin B12 Supplement, Manganous Oxide, Vitamin D3 Supplement, Ethylenediamine Dihydriodide (source of iodine), Riboflavin Supplement (Vitamin B2), Thiamine Mononitrate (Vitamin B1), Pyridoxine Hydrochloride (Vitamin B6), Folic Acid. Guide will need to be adjusted. For overweight pets feed to desired weight. - Pregnant/Nursing: feed approx. double the amount indicated in "Daily Serving Guide"
- Keep Fresh, clean water available at all times. - When transitioning from grain-based dry foods to Real Meat High Meat Diets, introduce slowly over 5 days. Can be mixed with dry food or rice/potato if all meat diet is to rich for animals with sensitive systems.When mixing with other foods reduce the amount of Real Meat Food accordingly to avoid overfeeding. - Can be fed as is for most pets or mixed with water for pets that need extra hydration due to health issues or lack of drinking water. - Take caution not to overfeed, each ounce of Real Meat Food is equivalent to 3ounces of fresh meat! - For pets with gas issues try adding 1 tablespoon plain yogurt to the meal.